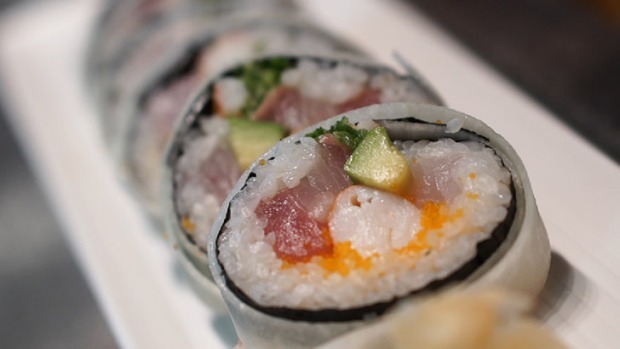 It may look simple, but it takes a dozen quality ingredients to make Nobu's signature sushi roll. He may not have heard of sushi doughnuts, but he sure does know how to make a pretty piece of sushi. Chef Nobuyuki Matsuhisa, or simply, Nobu, and his global Nobu restaurant brigade were recently in Australia ahead of the Melbourne restaurant's 10th anniversary. We caught up with the sushi master and asked him to share how to make his Melbourne house special cut sushi roll. Chef Nobu tweaks his restaurant menus to use local produce, and his Melbourne roll is packed full of yellowtail kingfish, tuna, snow crab, local prawns, hapuka (white fish), smelt roe, Australian wasabi, avocado and spring onion, and wrapped with nori and daikon radish. 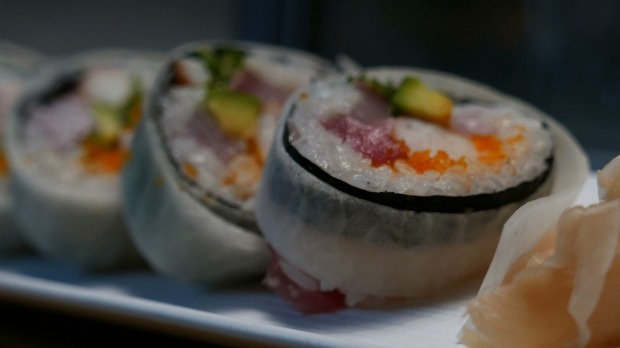 The colourful roll is sliced into six pieces, each designed to be eaten in one bite. "Everything is local fresh fish, so people eat one bite and can taste all the local fish," Nobu says. Wasabi translates to "kill the bacteria"(in the raw fish), says Nobu. Given the local roll contains a swipe of fresh wasabi, simply "touch" one side in soy sauce to serve, he suggests. The story behind that striking radish wrap? Nobu used the daikon to hide the nori when he started in America "more than 35 years ago", because diners didn't like the idea of eating "sea grass". He insists that sushi rolls have to include seaweed to add an umami flavour. When making sushi at home, Nobu suggests beginners start with simple handroll fillings such as cucumber, cooked prawns or smoked salmon, particularly for those who may be confronted by raw fish. Then move onto tuna and kingfish, perhaps using marinades to 'cook' the fish as a compromise. "My goal is for everyone [to] like the sushi." Carefully cut the daikon by hand and soften the sheets by soaking in water with a dash of soy sauce (similar to salt water) to make them more malleable. Don't be afraid of the seaweed sheet cracking, the sushi rice adds a little moisture and "it'll never crack". 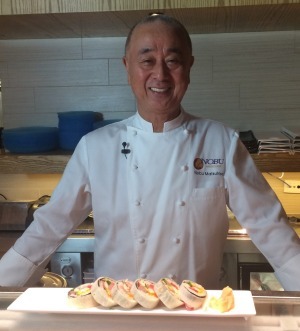 Nobu no longer uses sugar in his sushi rice, swapping it for a fruit-based sweetener. While he's not against beginners adding mayonnaise to handmade handrolls, Nobu believes sushi should be a "very clean taste".